Eight years after the show came to an end, The Inbetweeners are back together and filming ahead of their tenth anniversary show. 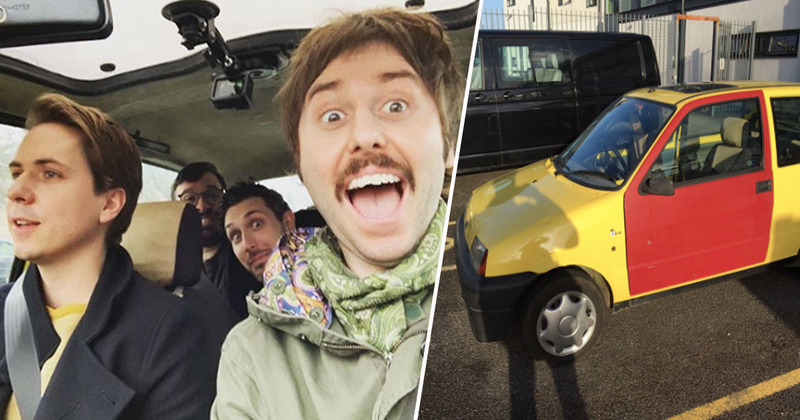 Simon Bird, Joe Thomas, James Buckley and Blake Harrison have reunited both with each other and with one of the most iconic props from the hilarious show, Simon’s yellow (with a red door) Fiat Cinquecento. As you may remember, the unfortunate car actually met its death in the final episode of series three when the boys went on a camping trip, the Fiat rolled down a hill and was submerged in a body of water. Now however it’s apparently been resurrected and dried off ready for filming once again – though I think the poor car has seen enough pain already, what with Neil defiling the back seat and the unfortunate accident at Thorpe Park which resulted in its red door. The collection of awkward characters will grace our television screens in the upcoming anniversary episode, which will celebrate the show’s three seasons and two films, featuring behind the scenes stories and unseen footage in a two-hour long special. I’m A Celebrity star Emily Atack, who played Charlotte Hinchcliffe in The Inbetweeners, is also said to be joining the boys in their reunion. The love for The Inbetweeners is huge, the kind of love that Jay would boast he’s had many times — big celebrities, millions of viewers and loving fans across the globe. And it’s so exciting the boys will be back together to feel that love from all those people and enjoy it first-hand. What could possibly go wrong? Buckley, aka Jay, shared a picture of the reunion to his Instagram page, where he looks just as excited as fans are about the prospect of him being back with his friends (aw, friends!). Sporting a new moustache which will no doubt get a mention from the other members of the group in the show, Buckley posed from the passenger seat of the car, where Thomas was back behind the wheel while Harrison and Bird squashed together in the back seat. It will certainly be interesting to get an insight into the characters and everything they’ve been up to since their last adventure four years ago in The Inbetweeners 2! I bet Jay’s slept with thousands of women. All celebrities, and he’s no doubt also rich. Probably this generation’s Hugh Hefner, if his previous stories about himself are anything to go by!